No question about it, today was tough. Wisconsin out played us in just about every phase of the game. I feel like if we played this game 100 times, they'd beat us 100 times. They're just that good. We'll dive into a little wrap-up later, but for now, it's Ohio State week. And thus, it's time to start the hatin'! 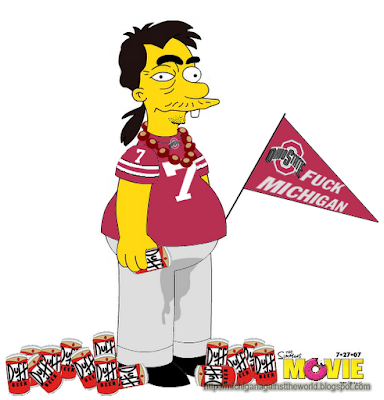 As much as I was a Wolverine fan, I must say I now rout for any team that plays Michigan. A fan for all of my life (will 50 years of it anyway), until Rod. I do not like him or his style of "football". If he thinks what he does is football, he's goofy. There's more to the game then a one man attack, it involves strategy, on both sides of the line, and at the minimum, 22 players. I miss Michigan football and hope it returns soon. I know that everyone is optimistic but keep in mind, Loyalty is wonderful and blind loyalty leads to destruction.